A married woman beguiles an insurance salesman into killing her husband for a big insurance payout. When Meatloaf sang the lyrics, "I would do anything for love, but I won't do that," is the "anything" he was referring to murdering a hot lady's husband for the insurance money? We may never know. 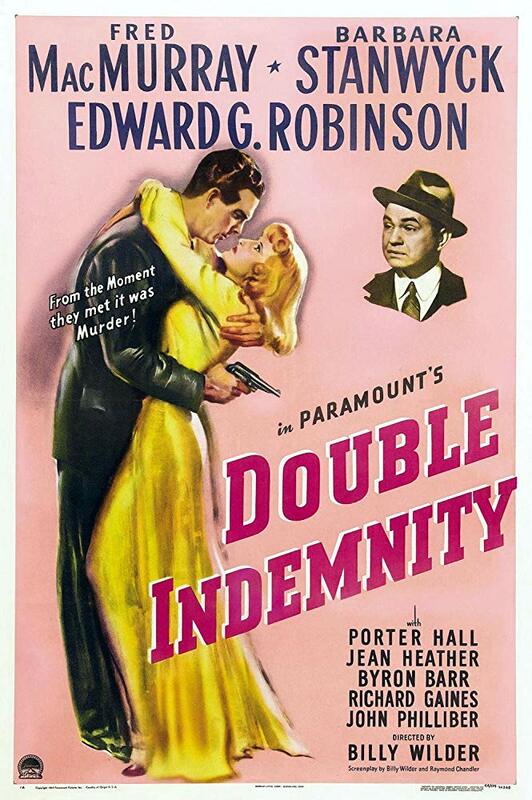 "Double Indemnity" is directed by the legendary 21-time Oscar nominee, six-time Oscar winner Billy Wilder, who has directed other films like "The Apartment," "Some Like it Hot," and "Sabrina." He also helped write the screenplay along with Raymond Chandler, which is based on the novel by James M. Cain. This film tells the story of insurance salesman Walter Neff (Fred MacMurray), and the movie is recanted/narrated by him. One day, Walter heads out on a routine house call to get a client of his, Mr. Dietrichson, to renew his auto insurance policy. 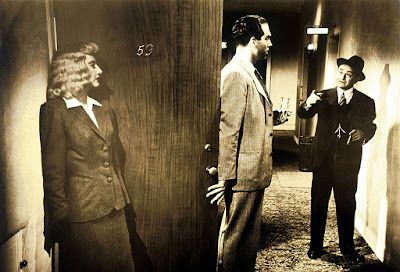 Once he arrives, Neff meets Mr. Dietrichson's young wife Phyllis (Barbara Stanwyck), who starts to inquire whether or not it might be possible to get an accident/life insurance policy without her husband's knowledge. This indicates to Neff that she has some nefarious intentions. He walks out at first but meets with her again later. 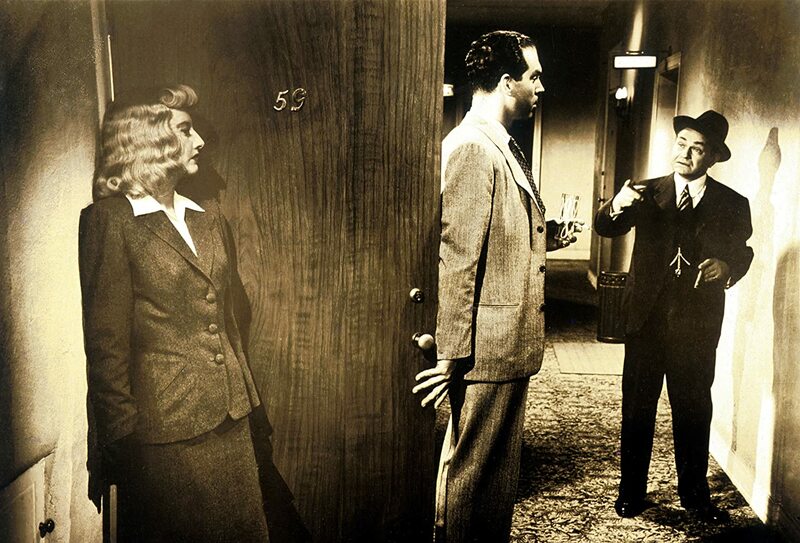 Neff is taken by Phyllis's beauty and decides to help her with her plan to kill her husband for a massive double indemnity insurance payout...and the promise that they will be together when the deed is done. We wonder what might run through a person's mind if they were put in a position like the one in "Double Indemnity." A woman approaches you and indicates she wants her husband murdered. On the one hand, it is a capital offense that is punishable by the death...but on the other hand, she's super pretty and she asked ya real, real nice! Decisions, decisions! Billy Wilder is a masterful director, and he and his crew have created an engaging noir crime thriller with "Double Indemnity." The narrative is enthralling and is steeped in tension from beginning to end. 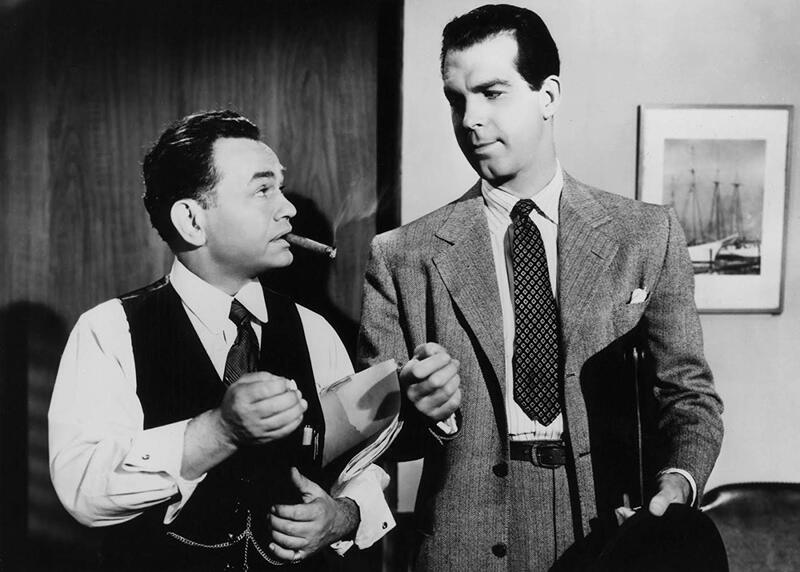 Fred MacMurray is excellent as lead character Walter Neff, who recounts the entire process of his and Dietrichson's crimes. He discusses how he initially resisted Phyllis's charm but fell for her because of her good looks into a recorder. Neff exclaims that her drive to get away from her husband drove their passionate affair and eventually led to their criminal activities. At some point, it all falls to pieces when obstacles far greater than they imagined begin to drive them apart. For BigJ, it was a bit odd seeing MacMurray in a heavier, more serious role like this because he remembers him best from his more lighthearted parts such reruns of "My Three Sons" and in Disney films like "The Absent-Minded Professor." MacMurray gives a commanding performance regardless. Barbara Stanwyck is absolutely fantastic as the sinister Phyllis Dietrichson, a role she originally didn't want to play because it required her to be so dubious. Stanwyck received a best actress nomination for her efforts and totally deserved such an honor. The fabulous Edward G. Robinson was not nominated for an Oscar for his role here, but no matter, he steals each and every scene he is in as insurance investigator Barton Keyes, the one obstacle in Walter and Phyllis's way that means the difference between them getting away with their crimes and them getting the gas chamber. Though there are some aspects of the film that are a bit dated, we still find "Double Indemnity" to be a worthwhile watch. It is a classic that had the honor of being nominated for best picture in what proved to be a highly competitive year.